My name is Stazia, I am completely new to the chicken game but have done A LOT of homework on raising chickens, incubating, brooding, housing you know that stuff. So technically I am completely ready and well informed. But, we'll see how much of that knowledge doesn't go right out the door when the real thing happens. 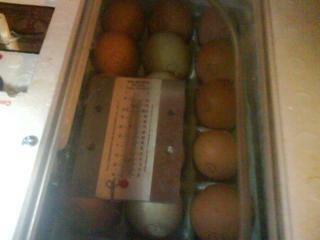 I have 30 eggs in the incubator right now. Turning, turning, turning...TURNING by hand every hour to make up for the overnight ( 10:00pm-6:30am get up and turn once more), and at work (7:00am-11:30am) stagnant sitting time. I'm on day 6 now and i can't wait, then again I can't believe i'm really doing this. I have lives in my hands now. I mean all the waiting, for the incubator, the chicken coop to get built (which is slowly but surely getting finished) the brooder lamp, the chick feeders and waterers, getting all these things together and collected so that when the final day arrives i will be prepared. phew, it's like i'm about to have a kid or something...lol...if everything goes right i'll have 30! I sing for church and everytime i go up to do special music, my heart starts pounding. Now every day that gets closer to the hatch date, i thinkone day soon i'll be watching them hatch, i get that same adrenaline rush....oh, I'm SOOO excited! i can't wait! Not much to look at but here they are, sitting waiting to hatch. MY chicken coop is FINALLY FINISHED!!! I'm on day 13 on the eggs in the bator...can't wait...it's getting closer to hatch day!